Kleresca® Acne Treatment is a breakthrough BioPhotonic treatment that improves moderate to severe acne and restores the skin’s complexion. BioPhotonic means that the light produces biological reactions in the skin, including killing bacteria, normalising cellular activity and stimulating the skin’s own repair systems to build-up collagen and reduce the signs of scarring. The treatment uses a unique light conversion system consisting of a high intensity LED lamp together with a photoconverter gel. A nurse applies the topical orange gel to the affected area, which is then illuminated under a multi-wavelength LED light for nine minutes. The gel is not absorbed or metabolized but patients experience a warming sensation on their skin during the treatment. After treatment, the gel is removed and the skin cleaned and moisturized. Make-up can be applied immediately after treatment. Kleresca® is administered twice a week for six weeks. The most common side-effects are transient redness, hyperpigmentation (bronzing of the skin) and slight discolouration of the hair. In clinical trials, Kleresca® Acne Treatment showed high efficacy in people with moderate to severe acne, with 9 out of 10 patients showing an improvement in their skin . Kleresca® Acne Treatment is a breakthrough BioPhotonic treatment that improves moderate to severe acne and restores the skin’s complexion. BioPhotonic means that the light produces biological reactions in the skin, including killing bacteria, normalising cellular activity and stimulating the skin’s own repair systems to build-up collagen and reduce the signs of scarring. The treatment uses a unique light conversion system consisting of a high intensity LED lamp together with a photoconverter gel. A nurse applies the topical orange gel to the affected area, which is then illuminated under a multi-wavelength LED light for nine minutes. The gel is not absorbed or metabolized but patients experience a warming sensation on their skin during the treatment. After treatment, the gel is removed and the skin cleaned and moisturized. Make-up can be applied immediately after treatment. Kleresca® is administered twice a week for six weeks. The most common side-effects are transient redness, hyperpigmentation (bronzing of the skin) and slight discolouration of the hair. 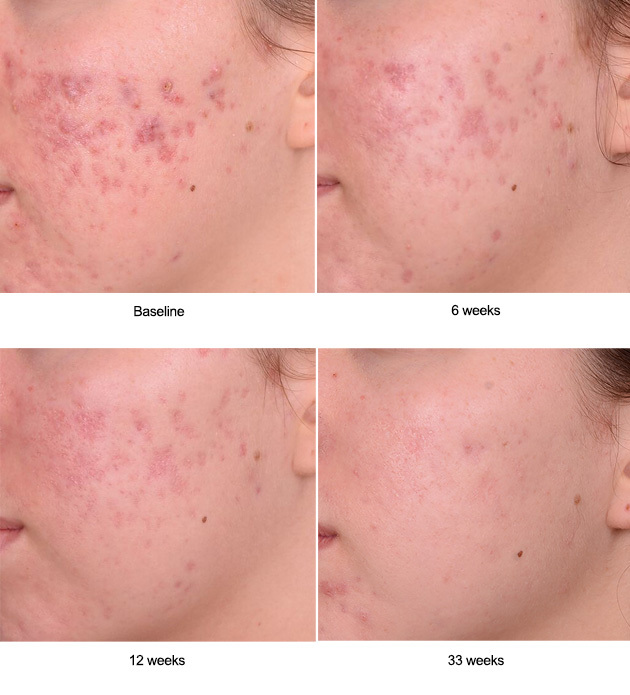 In clinical trials, Kleresca® Acne Treatment showed high efficacy in people with moderate to severe acne, with 9 out of 10 patients showing an improvement in their skin .